Joerg Mattes' research has focused on the pathogenesis of asthma, allergies and respiratory infections. The major sequence of recent projects undertaken in this area has involved clinical trials (e.g. the effect of asthma management/smoke cessation interventions during pregnancy on respiratory outcomes/lung function in the offspring; high-flow oxygen for the management of moderate severe bronchiolitis), clinical studies (e.g. biomarkers of peanut allergy and eosinophilic oesophagitis), experimental studies in asthma, rhinovirus infection and eosinophilic oesophagitis (e.g. role of micro(mi)RNAs; Midline-1). Some of his most significant research outcomes are published in The Lancet, Nature Medicine, Journal of Experimental Medicine, and Proceedings of the National Academy of Sciences. The works received prizes and awards. © 2018 Informa UK Limited, trading as Taylor & Francis Group Aim: Some infants with bronchopulmonary dysplasia (BPD) may require oxygen supplementation at home but a role for overnight polysomnography (PSG) in the management of home oxygen therapy has been rarely described. Methods: Forty-one infants with BPD born at less than 30 weeks gestational age were discharged with continuous home oxygen supplementation therapy between 2010 and 2013. PSG data were recorded on oxygen supplementation versus room air at median corrected age of 2 months (range 1¿5 months) (first PSG after discharge to home). Those infants who continued oxygen supplementation therapy at home had at least one more PSG before oxygen therapy was discontinued (last PSG). We also collected PSG data in 10 healthy term infants (median age 3.5 months; range 2¿4 months). Results: In infants with BPD in room air, increased numbers of central apneas, hypopneas, and SaO2 desaturations were the predominant PSG features with a median apnea¿hypopnea index (AHI) of 16.8 events per hour (range 0¿155). On oxygen supplementation therapy, median AHI dramatically improved (2.2, range 0¿22; p < .001) and was not different from control infants (2.0, range 0¿3.9; p = .31). AHI on room air at the last PSG when home oxygen was ceased was 4.1 per hour (range 0¿13.8) slightly higher than in healthy infants. Conclusion: Central sleep disordered breathing in infants with BPD dramatically normalizes with low flow nasal cannula home oxygen therapy and improves with age. Mild central sleep disordered breathing remains detectable, although much improved, when compared with healthy infants at the time when the decision to cease home oxygen therapy was made by the physician. © 2017 the American Physiological Society. The aim of this study is to elucidate the role of TRAIL during rhinovirus (RV) infection in vivo. Naïve wild-type and tumor necrosis factor-related apoptosis-inducing ligand (TRAIL)-deficient (Tnfsf10 -/- ) BALB/c mice were infected intranasally with RV1B. In separate experiments, Tnfsf10 -/- mice were sensitized and challenged via the airway route with house dust mite (HDM) to induce allergic airways disease and then challenged with RVIB or UV-RVIB. Airway hyperreactivity (AHR) was invasively assessed as total airways resistance in response to increasing methacholine challenge and inflammation was assessed in bronchoalveolar lavage fluid at multiple time points postinfection. Chemokines were quantified by ELISA of whole lung lysates and viral load was determined by quantitative RT-PCR and tissue culture infective dose (TCID 50 ). Human airway epithelial cells (BEAS2B) were infected with RV1B and stimulated with recombinant TRAIL or neutralizing anti-TRAIL antibodies and viral titer assessed by TCID50. HDM-challenged Tnfsf10 -/- mice were protected against RV-induced AHR and had suppressed cellular infiltration in the airways upon RV infection. Chemokine C-X-C-motif ligand 2 (CXCL2) production was suppressed in naïve Tnfsf10 -/- mice infected with RV1B, with less RV1B detected 24 h postinfection. This was associated with reduced apoptotic cell death and a reduction of interferon (IFN)-¿2/3 but not IFN-a or IFN-ß. TRAIL stimulation increased, whereas anti-TRAIL antibodies reduced viral replication in RV1B-infected BEAS2B cells in vitro. In conclusion, TRAIL promotes RV-induced AHR, inflammation and RV1B replication, implicating this molecule and its downstream signaling pathways as a possible target for the amelioration of RV1B-induced allergic and nonallergic lung inflammation and AHR. © 2017 Wiley Periodicals, Inc. Purpose: The purpose of this study was to compare (i) the exercise capacity and (ii) lung function prior to and immediately post cardiopulmonary exercise tests (CPET) of children who underwent early life lung resection for Congenital Pulmonary Airway Malformations (CPAM) to healthy control children. Method: Eight children with CPAM (four males, age 9.6 ± 1.8 years) and eight control children without respiratory disease (three males, age 9.4 ± 1.4 years) performed a CPET on a cycle ergometer, during which maximal oxygen consumption (V¿O2max) and heart rate were measured. Prior to and immediately post CPET, lung function measures including Nitrogen Multiple Breath Washout (MBW) and spirometry were performed. Results: There were no significant between group differences in pre CPET lung function (P > 0.05) or maximal exercise capacity (V¿O2max CPAM: 39.4 mL.kg-1.min-1, Control: 40.5 mL.kg-1.min-1). Post CPET, FEV1 was significantly lower in the CPAM group, with two participants diagnosed subsequently with exercise induced bronchospasm based on post-CPET spirometry and follow-up clinical investigations. Conclusion: Early life lung resection for CPAM does not appear to have negative implications for exercise capacity later in childhood. Clinicians should be aware that dyspnoea following exercise may be due to asthma rather than residual effects of CPAM in these children. © 2017 British Society for Immunology Clinical and epidemiological studies indicate that obesity affects the development and phenotype of asthma by inducing inflammatory mechanisms in addition to eosinophilic inflammation. The aim of this study was to assess the effect of obesity on allergic airway inflammation and T helper type 2 (Th2) immune responses using an experimental model of asthma in BALB/c mice. Mice fed a high-fat diet (HFD) for 10 weeks were sensitized and challenged with ovalbumin (OVA), and analyses were performed at 24 and 48 h after the last OVA challenge. Obesity induced an increase of inducible nitric oxide synthase (iNOS)-expressing macrophages and neutrophils which peaked at 48 h after the last OVA challenge, and was associated with higher levels of interleukin (IL)-4, IL-9, IL-17A, leptin and interferon (IFN)-¿ in the lungs. Higher goblet cell hyperplasia was associated with elevated mast cell influx into the lungs and trachea in the obese allergic mice. In contrast, early eosinophil influx and lower levels of IL-25, thymic stromal lymphopoietin (TSLP), CCL11 and OVA-specific immunoglobulin (IgE) were observed in the obese allergic mice in comparison to non-obese allergic mice. Moreover, obese mice showed higher numbers of mast cells regardless of OVA challenge. These results indicate that obesity affects allergic airway inflammation through mechanisms involving mast cell influx and the release of TSLP and IL-25, which favoured a delayed immune response with an exacerbated Th1, Th2 and Th17 profile. In this scenario, an intense mixed inflammatory granulocyte influx, classically activated macrophage accumulation and intense mucus production may contribute to a refractory therapeutic response and exacerbate asthma severity. © 2016 the American Physiological Society. Food antigens are common inflammatory triggers in pediatric eosinophilic esophagitis (EoE). TNFrelated apoptosis-inducing ligand (TRAIL) promotes eosinophilic inflammation through the upregulation of the E3 ubiquitin ligase Midline (MID)-1 and subsequent downregulation of protein phosphatase 2A (PP2A), but the role of this pathway in EoE that is experimentally induced by repeated food antigen challenges has not been investigated. Esophageal mucosal biopsies were collected from children with EoE and controls and assessed for TRAIL and MID-1 protein and mRNA transcript levels. Wild-type and TRAIL-deficient (Tnfsf10 -/- ) mice were administered subcutaneous ovalbumin (OVA) followed by oral OVA challenges. In separate experiments, OVA-challenged mice were intraperitoneally administered salmeterol or dexamethasone. Esophageal biopsies from children with EoE revealed increased levels of TRAIL and MID-1 and reduced PP2A activation compared with controls. Tnfsf10 -/- mice were largely protected from esophageal fibrosis, eosinophilic inflammation, and the upregulation of TSLP, IL-5, IL-13, and CCL11 when compared with wild-type mice. Salmeterol administration to wild-type mice with experimental EoE restored PP2A activity and also prevented esophageal eosinophilia, inflammatory cytokine expression, and remodeling, which was comparable to the treatment effect of dexamethasone. TRAIL and PP2A regulate inflammation and fibrosis in experimental EoE, which can be therapeutically modulated by salmeterol. The raised volume rapid thoracoabdominal compression (RVRTC) technique is commonly used to obtain full forced expiratory manoeuvres from infants, but reference equations derived from &apos;in-house&apos; equipment have been shown to be inappropriate for current commercially available devices. Aim: To explore the impact of equipment differences on RVRTC outcomes, derive robust equipment-specific RVRTC reference ranges and investigate their potential clinical impact on data interpretation. Method: RVRTC data from healthy subjects using Jaeger BabyBody or the &apos;Respiratory Analysis Software Program, RASP&apos; systems were collated from four centres internationally. Data were excluded if gestational age <37 weeks or birth weight <2.5 kg. Reference equations for RVRTC outcomes were constructed using the LMS (lambda-mu-sigma) method, and compared with published equations using data from newborn screened infants with cystic fibrosis (CF). Results: RVRTC data from 429 healthy infants (50.3% boys; 88% white infants) on 639 occasions aged 4-118 weeks were available. When plotted against length, flows were significantly higher with RASP than Jaeger, requiring construction of separate equipment-specific regression equations. When comparing results derived from the new equations with those from widely used published equations based on different equipments, discrepancies in forced expiratory volumes and flows of up to 2.5 z-scores were observed, the magnitude of which increased with age. According to published equations, 25% of infants with CF fell below the 95% limits of normal for FEV0.5, compared with only 10% when using the new equations. Conclusions: Use of equipment-specific prediction equations for RVRTC outcomes will enhance interpretation of infant lung function results; particularly during longitudinal follow-up. © 2016 the American Physiological Society. We tested whether the T helper (Th) type 2 (Th2) cell agonist and allergenic ligand IL-33 was associated with eosinophilic esophagitis (EoE) development in a pediatric cohort and whether IL-33 protein could induce disease symptoms in mice. Biopsies from EoE patients or controls were used to measure IL-33 mRNA and protein expression. Increased expression of IL-33 mRNA was found in the esophageal mucosa in EoE. IL-33 protein was detected in cells negative for CD45, mast cells, and epithelial cell markers near blood vessels. Circulating levels of IL-33 were not increased. The time course for IL-33 gene expression was quantified in an established Aspergillus fumigatus allergen mouse model of EoE. Because IL-33 induction was transient in this model and chronicity of IL-33 expression has been demonstrated in humans, naive mice were treated with recombinant IL-33 for 1 wk and esophageal pathology was evaluated. IL-33 application produced changes consistent with phenotypically early EoE, including transmural eosinophilia, mucosal hyperproliferation, and upregulation of eosinophilic genes and chemokines. Th2 cytokines, including IL-13, along with innate lymphoid cell group 2, Th1/17, and M2 macrophage marker genes, were increased after IL-33 application. IL-33-induced eosinophilia was ablated in IL-13 null mice. In addition, IL-33 induced a profound inhibition of the regulatory T cell gene signature. We conclude that IL-33 gene expression is associated with pediatric EoE development and that application of recombinant protein in mice phenocopies the early clinical phase of the human disease in an IL-13-dependent manner. IL-33 inhibition of esophageal regulatory T cell function may induce loss of antigenic tolerance, thereby providing a mechanistic rationale for EoE development. © 2015 Macmillan Publishers Limited. All rights reserved. Asthma is prevalent in Western countries, and recent explanations have evoked the actions of the gut microbiota. Here we show that feeding mice a high-fibre diet yields a distinctive gut microbiota, which increases the levels of the short-chain fatty acid, acetate. High-fibre or acetate-feeding led to marked suppression of allergic airways disease (AAD, a model for human asthma), by enhancing T-regulatory cell numbers and function. Acetate increases acetylation at the Foxp3 promoter, likely through HDAC9 inhibition. Epigenetic effects of fibre/acetate in adult mice led us to examine the influence of maternal intake of fibre/acetate. High-fibre/acetate feeding of pregnant mice imparts on their adult offspring an inability to develop robust AAD. High fibre/acetate suppresses expression of certain genes in the mouse fetal lung linked to both human asthma and mouse AAD. Thus, diet acting on the gut microbiota profoundly influences airway responses, and may represent an approach to prevent asthma, including during pregnancy. © Schilter et al. Background and purpose: The persistent influx of neutrophils into the lung and subsequent tissue damage are characteristics of COPD, cystic fibrosis and acute lung inflammation. VAP-1/SSAO is an endothelial bound adhesion molecule with amine oxidase activity that is reported to be involved in neutrophil egress from the microvasculature during inflammation. This study explored the role of VAP-1/SSAO in neutrophilic lung mediated diseases and examined the therapeutic potential of the selective inhibitor PXS-4728A. Methods: Mice treated with PXS-4728A underwent intra-vital microscopy visualization of the cremaster muscle upon CXCL1/KC stimulation. LPS inflammation, Klebsiella pneumoniae infection, cecal ligation and puncture as well as rhinovirus exacerbated asthma models were also assessed using PXS-4728A. Results: Selective VAP-1/SSAO inhibition by PXS-4728A diminished leukocyte rolling and adherence induced by CXCL1/KC. Inhibition of VAP-1/SSAO also dampened the migration of neutrophils to the lungs in response to LPS, Klebsiella pneumoniae lung infection and CLP induced sepsis; whilst still allowing for normal neutrophil defense function, resulting in increased survival. The functional effects of this inhibition were demonstrated in the RV exacerbated asthma model, with a reduction in cellular infiltrate correlating with a reduction in airways hyperractivity. Conclusions and implications: This study demonstrates that the endothelial cell ligand VAP-1/SSAO contributes to the migration of neutrophils during acute lung inflammation, pulmonary infection and airway hyperractivity. These results highlight the potential of inhibiting of VAP-1/SSAO enzymatic function, by PXS-4728A, as a novel therapeutic approach in lung diseases that are characterized by neutrophilic pattern of inflammation. © 2015 BMJ Publishing Group Ltd & British Thoracic Society.Background Asthma exacerbations represent a significant disease burden and are commonly caused by rhinovirus (RV), which is sensed by Toll-like receptors (TLR) such as TLR7. Some asthmatics have impaired interferon (IFN) responses to RV, but the underlying mechanisms of this clinically relevant observation are poorly understood. Objectives To investigate the importance of intact TLR7 signalling in vivo during RV exacerbation using mouse models of house dust mite (HDM)-induced allergic airways disease exacerbated by a superimposed RV infection. Methods Wild-type and TLR7-deficient (Tlr7<sup>-/-</sup>) BALB/c mice were intranasally sensitised and challenged with HDM prior to infection with RV1B. In some experiments, mice were administered recombinant IFN or adoptively transferred with plasmacytoid dendritic cells (pDC). Results Allergic Tlr7<sup>-/-</sup> mice displayed impaired IFN release upon RV1B infection, increased virus replication and exaggerated eosinophilic inflammation and airways hyper reactivity. Treatment with exogenous IFN or adoptive transfer of TLR7-competent pDCs blocked these exaggerated inflammatory responses and boosted IFN? release in the absence of host TLR7 signalling. TLR7 expression in the lungs was suppressed by allergic inflammation and by interleukin (IL)-5-induced eosinophilia in the absence of allergy. Subjects with moderate-to-severe asthma and eosinophilic but not neutrophilic airways inflammation, despite inhaled steroids, showed reduced TLR7 and IFN?2/3 expression in endobronchial biopsies. Furthermore, TLR7 expression inversely correlated with percentage of sputum eosinophils. Conclusions This implicates IL-5-induced airways eosinophilia as a negative regulator of TLR7 expression and antiviral responses, which provides a molecular mechanism underpinning the effect of eosinophil-targeting treatments for the prevention of asthma exacerbations. Copyright © 2015 by The American Association of Immunologists, Inc. Rhinovirus (RV) infections are common and have the potential to exacerbate asthma. We have determined the lung transcriptome in RV strain 1B-infected naive BALB/c mice (nonallergic) and identified CCL7 and IFN regulatory factor (IRF)-7 among the most upregulated mRNA transcripts in the lung. To investigate their roles we employed anti-CCL7 Abs and an IRF-7-targeting small interfering RNA in vivo. Neutralizing CCL7 or inhibiting IRF-7 limited neutrophil and macrophage influx and IFN responses in nonallergic mice. Neutralizing CCL7 also reduced activation of NF-¿B p65 and p50 subunits, as well as airway hyperreactivity (AHR) in nonallergic mice. However, neither NF-¿B subunit activation nor AHR was abolished with infection of allergic mice after neutralizing CCL7, despite a reduction in the number of neutrophils, macrophages, and eosinophils. IRF-7 small interfering RNA primarily suppressed IFN-a and IFN-b levels during infection of allergic mice. Our data highlight a pivotal role of CCL7 and IRF-7 in RV-induced inflammation and IFN responses and link NF-¿B signaling to the development of AHR. Objective Maternal asthma is the most common chronic disease complicating pregnancy and is a risk factor for bronchiolitis in infancy. Recurrent episodes of bronchiolitis are strongly associated with the development of childhood asthma. Methods We conducted a follow-up study of infants born to women with asthma who completed a double-blind randomised controlled trial during pregnancy. 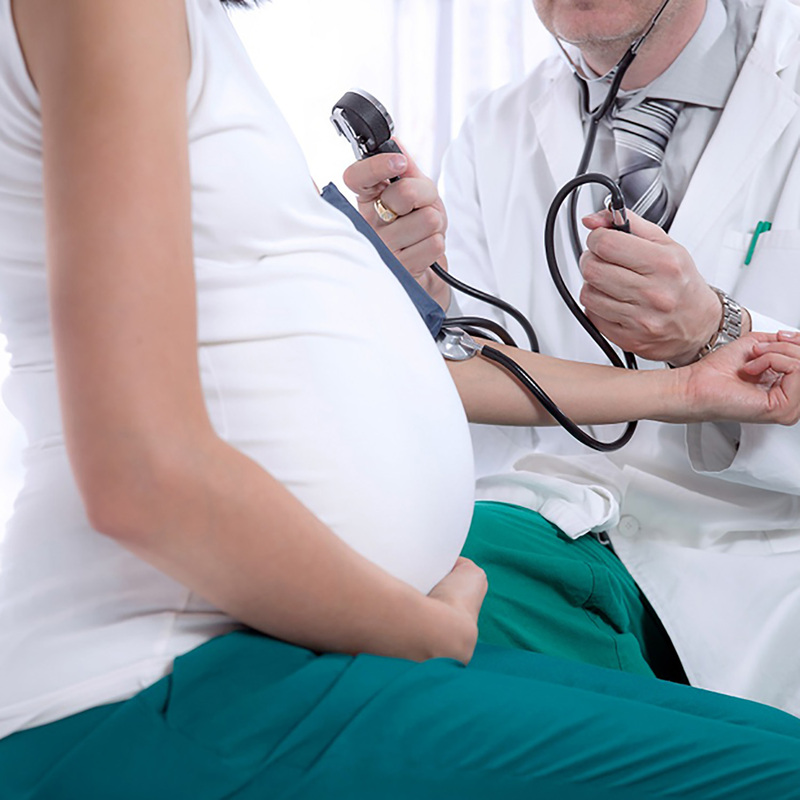 In this trial, pregnant women with asthma were assigned to treatment adjustment by an algorithm using clinical symptoms (clinical group) or the fraction of exhaled nitric oxide (FeNO group) and we showed that the FeNO group had significantly lower asthma exacerbation rates in pregnancy. Results 146 infants attended the 12-month follow-up visit. Infants born to mothers from the FeNO group were significantly less likely to have recurrent episodes of bronchiolitis in the first year of life (OR 0.08, 95% CI 0.01 to 0.62; p=0.016) as compared with the clinical group. Conclusions Optimised management of asthma during pregnancy may reduce recurrent episodes of bronchiolitis in infancy, which could potentially modulate the risk to develop or the severity of emerging childhood asthma. The rising prevalence of asthma and atopic disease in industrialized countries in the last 50 years has raised important questions about how and why the disease develops in susceptible populations. Most asthma begins in childhood in association with allergic sensitization and the development of a TH2 phenotype. It is recognized that asthma arises in the context of a complex interaction between genetic factors and the evolving immune system of the infant and the environment to which it is exposed, which now includes its in utero exposure. Early life exposures that lead to allergen sensitization and airway damage, especially in the form of viral respiratory tract infections, may lead to disease induction that commence the process that leads in some to asthma. Asthma models and early life observations suggest that repeated exposure to allergens and viral infection perpetuate a state of chronic airway inflammation leading to a maladaptive innate immune response that fails to resolve, characterized by chronic airway inflammation, airway remodeling and airway hyperresponsiveness. This article will concentrate on the development of asthma in the context of early life and maternal influences, including the effect of asthma on both the fetus and the mother. © 2014 Informa UK Ltd.
Allergic asthma is a complex disease characterized by acute inflammation of the airways that over time leads to the development of significant structural changes termed remodeling. TNF-related apoptosis-inducing ligand (TRAIL) has an important regulatory role in acute allergic airways inflammation through up-regulation of the E3 ubiquitin ligase Midline-1 (MID-1), which limits protein phosphatase 2A (PP2A) activity and downstream dephosphorylation of proinflammatory signaling molecules. The relevance of TRAIL in the development of airways remodeling has yet to be determined. In this study, the lungs of wild-type (WT) BALB/c and Tnfsf10 knockout (TRAIL-/-) mice were chronically exposed to ovalbumin (OVA) for 12 weeks to induce hallmark features of chronic allergic airways disease, including airways hyperreactivity (AHR), subepithelial collagen deposition, goblet cell hyperplasia, and smooth muscle hypertrophy. TRAIL-/- mice were largely protected from the development of AHR and peribronchial eosinophilia and had reduced levels of mast cells in the airways. This correlated with lower levels of cytokines, including IL-4, -5, -10, and -13, and with lower levels of proinflammatory chemokines from cultured cells isolated from the draining lymph nodes. TRAIL-/- mice were also protected from the characteristic features of airways remodeling, including peribronchial fibrosis, smooth muscle hypertrophy, and mucus hypersecretion, which correlated with reduced TGF-ß1 levels in the lungs. MID-1 expression was reduced in TRAIL-/- mice and up-regulated in allergic WT mice. Raising PP2A activity using 2-amino-4-(4-heptyloyphenol)-2-methylbutan-1-ol in allergic WT mice reduced eosinophilia, TGF-ß1, and peribronchial fibrosis. This study shows that TRAIL promotes airways remodeling in an OVA-induced model of chronic allergic airways disease. Targeting TRAIL and its downstream proin flammatory signaling pathway involving PP2A may be of therapeutic bene fit in reducing the hallmark features of airways remodeling observed in chronic allergic airways inflammation. Copyright © 2014 by the American Thoracic Society. Chronic inflammatory diseases (e.g. asthma and chronic obstructive pulmonary disease) are leading causes of morbidity and mortality world-wide and effective treatments are limited. These disorders can often be attributed to abnormal immune responses to environmental stimuli and infections. Mechanisms leading to inflammation are complex, resulting from interactions of structural cells and activation of both the adaptive and innate arms of the immune system. The activation of structural and immune cells involves both temporary and permanent changes in gene expression in these cells, which underpin chronic inflammation and tissue dysfunction. miRNAs are small non-coding RNAs increasingly being recognized to play important roles in the post-transcriptional regulation of gene expression in mammalian cells by regulating translation. Individual miRNAs can exert their effects by directly inhibiting the translation or stability of multiple mRNAs simultaneously. Thus, the expression or blockade of function of a single miRNA (miR) can result in pronounced alterations in protein expression within a given cell. Dysregulation of miRNA expression may subsequently alter cellular function, and in certain situations predispose to disease. Our current understanding of the role of miRNA in the regulation of inflammatory disease (e.g. allergic diseases) remains limited. In this review, we provide an overview of the current understanding of miRNA biogenesis and function, the roles miRNA play in the regulation of immune cell function and their potential contribution to inflammatory diseases. We also highlight strategies to alter miRNA function for experimental or therapeutic gain, and discuss the potential utility and limitations of targeting these molecules as anti-inflammatory strategies. © 2013 John Wiley & Sons Ltd.
Hypercalcaemia in infants with Down syndrome is an uncommon condition with only five previous case reports. The patients often present in the toddler years with the classical triad of Down syndrome, biochemical hypercalcaemia, and nephrocalcinosis. We present the sixth case and second male with this condition and further review the clinical details of this under-recognised condition and stratify the diagnostic criteria. The management mandates a reduction in calcium intake as a first step. The natural history of the various aspects of this condition is also considered. The use of objective outcome measures that assess airway inflammation in pediatric asthma can provide a good evaluation of asthma severity and treatment response. In this double-blind and randomized study the effects of 200 µg of budesonide and 800 µg of budesonide on markers of inflammation (exhaled nitric oxide (eNO), eosinophil protein X (EPX) excretion in urine) and on lung function (FEV 1) were prospectively investigated in 24 ICS-naive children with mild persistent to moderate persistent asthma over a period of eight weeks. After eight weeks of treatment 200 µg and 800 µg of budesonide led to a significant decrease (p < 0.025) in eNO [median (90% interval): 200 µg: -17.2 ppb (-54.6 to 0.9); 800 µg: -13.2 ppb (-44.6 to -1.7)]. A significant change in urinary EPX excretion was only observed in the high dose group [200 µg: -10.3 µg/mmol creatinine (-116.2 to 50.5), p = 0.9; 800 µg: -49.2 µg/mmol creatinine (-231.0 to 48.7), p = 0.02]. However, a significant difference between the change from baseline after 8 weeks of either group was found neither for eNO (p = 0.66) nor for EPX excretion (p = 0.04). In conclusion, our data demonstrate that 800 µg budesonide per day did not show any advantage in reduction of airway inflammation, measured by eNO and urinary EPX excretion, in children with mild persistent to moderate persistent asthma. In asthmatic children sputum-induction with hypertonic saline is useful to quantify the eosinophilic inflammation. However, only few data are available about feasibility and safety of the procedure in children. Therefore, taking 9 non-atopic healthy control children (mean age 11,8 years) and 34 asthmatic children (mean age 11,4 years), inhaling n = 25 Budesonid (400-1200 µg/die) and n = 9 DNCG (60 mg/die), sputum induction was performed twice within 6 weeks. Briefly, 10 minutes after inhalation of 200 µg salbutamol subjects inhaled hypertonic saline (3, 4 and 5%) for in all 30 minutes, while all 5 minutes lung function was checked and expectoration of sputum was supported. Adequate sputum plugs were separated from contaminating saliva and processed immediately employing native chamber and cytospin cell count as well as measurement of eosinophilic: cationic protein (ECP). Sputum-induction could be performed in 84 out of 86 planed tests (97,7%) without any objective clinical adverse effects. The mean fall in FEV1 was 3,0%, the maximum 11,0%. The reproducibility of eosinophil, neutrophil and lymphocyte differential cell count (5-95%-values Test1: 0,0- 4.2%, 0,8 - 11,4%, and 3.2 - 35,1%, respectively) was moderate for eosinophils and neutrophils (Intraclass-Correlation-Coefficient (ICC) 0,41) as well as for lymphocytes (ICC = 0,49). For ECP 5-95%-values Test1: 39,8-8000.0 µg/l) only a fair reproducibility (ICC = 0,24) was found. The ICC levels for total cell count (ICC = 0,31) and for weight of the sputum plug (ICC = 0,30) were also fair. Based on the procedure presented induced sputum is a feasible and safe method in childhood. The differential sputum cell count of eosinophils, neutrophils and lymphocytes can be recommended as parameters with moderate reproducibility. Researchers have confirmed that when a woman’s asthma medication is optimally during pregnancy, the rate of asthma in her offspring is nearly halved.